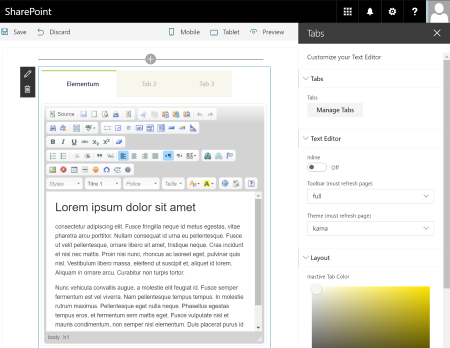 The Tabs Web Part is a SharePoint client side web part built with the SharePoint Framework (SPFx). This web part helps to create a tab (you manage, add, delete, edit or move a tab dynamically) and the web part editor can easily modify the tabs content thanks a HTML editor (WYSIWYG). This tab control is responive, so the layout will adapt the render with the screen size. inline: with this setting, you can choose if the toolbar appears over the text or in fixed position on top. Default is true. mode: type of toolbar, can be 'standard', 'full' or 'basic'. Default is full.